I've got the morning off. I could have off till 6:30 if I want to. Kadramas who is now in charge said I didn't have to come in. But I may go over there to keep from being bored to death just sitting around. To clear a few things up. SP/5 Brewer who was in charge just up and quit. Don't ask me how he managed it but he is now on burm detail. I think he had the idea Avionics wouldn't survive without him and he was going to leave for a while and prove it. Avionics is still chugging along without him. The whole mess doesn't make sense to me. I'm not really essential to that shop except for radio relay and they wouldn't let me volunteer for detail every day. Yet Bremer who is actually the only one in the shop who has an Avionics MOS can just leave. He already has a year's experience working as an avionics line-man in Vietnam. So now we have an E-6, Sgt. Carter, in charge, but he has delegated all his responsibility to Kadramas. As long as the work gets done Sgt. Carter doesn't bother us. Kadramas finally got the extension he asked for so now he leaves a little after I do and ETS's 5 months early. He was in for three years and the only reason he extended over here was so he could get an early out. Up until last week they weren't going to let him extend for those last two months and he would have had to leave in November and spend 7 months in the states. But as it stands now he will leave in January and ETS. I think I told you that Sylvester left over the weekend. He was a three year man too. He overextended you might say. They gave him a 60 day drop from his extension and let him out 5 months early. I don't think I ever mentioned but O'Briant and Claybough are three year men too. I'm one of the few draftees around here. Most of the crew chiefs are three year men too. You asked about Deskin, well he left while I was in Vung Tau and I sort of forgot about him until I got that letter. The place he is staying is in the Central Highlands about 30 miles from the Cambodian border north of Pleiku. It's called Ban Me Thuot. He is working as an 05C and he says he likes it there. Well, it's 9:30. I think I'll go catch some of the early morning sunshine. The dry season is definitely on it's way. 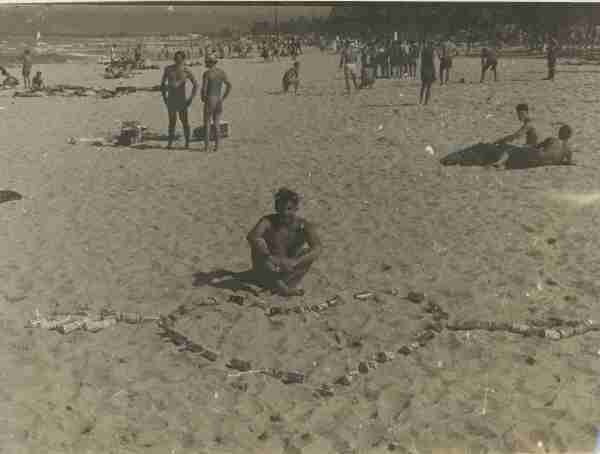 Enclosed is a picture of Duff taken on Valentines day at China Beach. You can't see the whole thing but there is a heart with an arrow through it made out of beer cans and soda cans.